After hitting .314 to help the Charleston Senators win the Middle Atlantic League title in 1942, Johnny Blatnik was invited to spring training by the Cleveland Indians the next year. But Uncle Sam had different ideas, instructing the 21-year-old to head to basic training with the United States Army. Blatnik, who grew up in the tiny village of Bridgeport, Ohio, was sent to Fort Hayes in Columbus, Ohio, and he spent the next three years not in Cleveland blue but in Army green. John Louis Blatnik was born on March 10, 1921, to Slovenian immigrants in a small community known then as Goosetown, a close-knit neighborhood just outside of Bridgeport, Ohio. (Bridgeport is just across the Ohio River from Wheeling, West Virginia.) His father, Frank, a coal miner, was a stern man who practiced both atheism and socialism. But his mother, Rose, saw to it that everyone in her family was baptized and practiced their faith. Johnny shared a room with his brothers, Frank Jr. and Al. Their small house was heated by a single coal stove, which also served as the family cooking stove. Fresh water had to be hauled in from the outside, which also was where the family bathroom was located. Blatnik excelled on his teams at Bridgeport High School, the same school that later produced Phil and Joe Niekro, basketball star John Havlicek, football star Bill Jobko, and Olympic wrestling champion Bobby Douglas. Blatnik was a standout on the Bulldogs' basketball team, and he led the team to the state tournament. During his high-school years he met Gladys Weilba, a blonde girl who became the love of his life for the next 60-plus years. During his high-school summers, Blatnik starred for the Bridgeport National Bank junior baseball team. His talent caught the eye of Cleveland Indians scouts, who brought him to work out under the eyes of the front-office staff when the Indians were home. After he graduated from high school in 1939, Blatnik signed an Indians contract. He was sent to Greensburg of the Class D Pennsylvania State Association, where he played first base and batted .302 in 36 games. He went a little farther from home for the 1940 season, playing third base for the Fargo-Moorhead Twins in the Class D Northern League. It was in the cold plains that Blatnik became a hot commodity, hitting .289 with 10 homers and 67 RBIs, earning recognition as the league's top third baseman, and getting a promotion to Charleston, West Virginia, in the Class C Middle Atlantic League. His numbers dwindled a bit in 1941, to .247-4-38. He was converted to the outfield because, as he joked, the managers grew weary of seeing him field everything with his chest. The move from the hot corner to greener pastures in 1942 proved beneficial as Blatnik rebounded to hit .314. But as he was on the verge of establishing himself as a part of the Indians’ future, America was on the verge of entering World War II. In between guarding troops and killing snakes, Blatnik found time to star on the unit’s baseball club. He said he hit .356. He was transferred to Maxwell Field in Miami, Florida, then to flight officers school in Amarillo, Texas, and finally to Furman University to learn to fly. He also found time to play baseball, basketball, and football. Despite his lack of gridiron experience – his family never let him go out for high-school football – he played well enough to be offered eight college scholarships. During a furlough in 1944, Blatnik returned home to marry Gladys. The two exchanged vows on November 11, 1944. “We got married on Armistice Day,” he laughed. “We started our own war.”2 The couple remained together for the next 60 years, raising two children. Their son, Jay, went on to become a chiropractor in the Columbus, Ohio, area, while daughter Johnette taught special education in the St. Clairsville, Ohio, school district for years. With the war over and thousands of ballplayers returning home, Blatnik had to re-establish himself in the minor leagues. The Indians assigned him in 1946 to Harrisburg, Pennsylvania, in the Class B Interstate League. The now 25-year-old improved considerably from where he had left off four years earlier, earning all-star recognition while leading the league with 189 hits and finishing among the leaders with a .336 batting average, 19 homers, and 108 runs batted in. The Senators finished second in the regular season and defeated both Allentown and Wilmington four games to one to win the postseason title. Despite the banner season, Blatnik was left unprotected by Cleveland during the winter. Philadelphia Phillies manager Ben Chapman liked what he had seen in Blatnik and coaxed the Phillies into taking a chance on the outfielder. Blatnik joined the Wilkes-Barre Barons in the Class A Eastern League for 1947, and he helped lead the Barons into the postseason playoffs against Utica, hitting .334 with 10 home runs and 91 RBIs. He battled all summer for the batting crown with Joe Tipton and Richie Ashburn, both of Utica. Tipton, a catcher, hit .375 to win the title, Ashburn finishing second, and Blatnik third. Utica also defeated Wilkes-Barre in the opening round of the playoffs before going on to win the Eastern League championship. 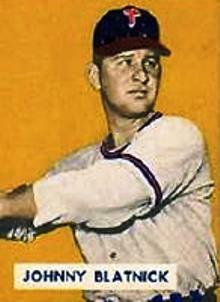 Blatnik finally made the big leagues in 1948, joining the Phillies as a reserve outfielder. Future Hall of Famer Ashburn patrolled center field, flanked by Del Ennis in right and Harry “The Hat” Walker in left. Blatnik soon took over in left after Walker came down with the flu early in the season. The 27-year-old rookie seized the opportunity and took the starting job. Blatnik stroked his major-league first hit off Brooklyn Dodgers pitcher Rex Barney. He went 6-for-9 in a May 9 doubleheader in Cincinnati and followed that up with a 4-for-4 performance on May 12 in Pittsburgh in front of several Ohio Valley well-wishers to see his early-season batting average soar to .444 and to the top of the National League. Blatnik credited his hitting success to a spring-training talk he had with Ted Williams after an exhibition game. Williams corrected a flaw in Blatnik’s stance, and the pupil followed the teacher’s advice. The Phillies struggled out of the gate that season, ultimately finishing sixth, 25½ games behind the pennant-winning Boston Braves. Blatnik also slumped toward the end of the season after suffering sunstroke one afternoon at Pittsburgh’s Forbes Field. He still finished with a respectable .260 batting average with six homers and 45 RBIs. His 27 doubles ranked ninth in the National League, while his eight triples were eighth. Somewhere along the way, he picked up the nickname “Chief,” though Blatnik said he never knew why. In 1949 Blatnik was relegated to the bench behind Bill “Swish” Nicholson, a veteran slugger who had joined the Phillies after 10 seasons with the Chicago Cubs. After limited action, Blatnik was sent to the Toronto Maple Leafs of the International League, where he batted .294 with 15 homers and 80 runs batted in to warrant a late promotion back to Philadelphia. Overall, Blatnik hit just 1-for-8 in six games with the Phillies, but did appear on his first (and only) baseball card that year with the Bowman company. Unfortunately, his name was incorrectly spelled “B-L-A-T-N-I-C-K” on the card front. Blatnik saw few opportunities in the Phillies’ magical Whiz Kids year of 1950. Appearing in only four games in the first month of the season, he was hitting .250 on April 27 when he was dealt to the St. Louis Cardinals for pitcher Ken Johnson. After hitting just .150 in seven games with St. Louis, on May 14 Blatnik played in his final big-league game before being sent to Houston of the Texas League. There, he turned in a .252 batting average with 9 home runs and 42 RBIs. Blatnik spent the next six seasons in the International League for various teams. In 1951, with Rochester, he put up solid numbers (.271-11-60) to help the Red Wings make the postseason playoffs, where they fell to Syracuse. Blatnik split the 1952 season between Rochester and Syracuse, combining to hit .274-17-66. To add injury to the insult of being traded, his former team swept Syracuse in four games in the opening round of the playoffs. Syracuse struggled in 1953, dropping all the way to seventh place (and 38½ games back) in the eight-team circuit. Blatnik turned in a solid .266-18-76 season. Syracuse rose to fourth place in 1954, helped by Blatnik’s. 247 batting average, 14 homers, and 71 RBIs. The season ended on a sweet note as the Chiefs took the postseason title, beating Toronto and Montreal four games to three in the playoffs. Blatnik saw his opportunities dwindle during the next two seasons, hitting .308-4-14 in 37 games in 1955 with Syracuse and .306-0-2 in 22 games with Buffalo. Though he retired from professional baseball after the 1956 season at the age of 35, Blatnik was not through with the game. He and his family settled into a home in the small community of Lansing, Ohio, not far from Bridgeport, and he took a job as the deputy director of workers compensation for the state of Ohio. He began officiating high-school, college and semipro football, high-school basketball, and high-school and college baseball. He remembered shutting up an irate fan complaining about his calling of balls and strikes one hot afternoon by telling the fan that if he could still see, he would still be playing pro ball. Blatnik and John Laslo, the mayor of neighboring Martins Ferry, Ohio, joined together to start Colt and PONY League baseball in the Ohio Valley. Blatnik served as director of several tournaments up and down the East Coast during his tenure, never taking a dime in expense money, preferring instead that it be spent on the kids. During this same time, his brother Al became somewhat of a coaching legend at Bridgeport High School and later across the Ohio River at West Liberty (West Virginia) State College. Johnny’s nephew and Al’s son, Floyd Shuler, became an all-West Virginia Conference shortstop at West Liberty. Shuler later went on to become one of the top collegiate basketball referees on the East Coast. The Blatniks eventually settled into a laid-back life along their rural road, watching the occasional ballgame, going fishing or taking in a minor-league hockey game in Wheeling. That all changed on November 22, 1997. Gladys wondered why her husband had not come down to watch his beloved Ohio State Buckeyes in their annual football battle with archrival Michigan. She went up to the bedroom to check and discovered that he had suffered a stroke. While hospitalized and trying to battle back to health, he was plagued by pneumonia, a blood clot, and a bad reaction to antibiotics. Still, nine months later, he showed up sure as clockwork for the annual Holloway, Ohio, Old Timers baseball festival, where he threw out the ceremonial first pitch. Later in December, the Belmont County Commission voted 2-1 to rename the road on which Johnny and Gladys had resided for decades as Johnny Blatnik Road. Commissioner Mike Bianconi was the lone vote against the move on the county commission, and controversy soon followed. Bruce Seabright, II, who also lived on the Blaine-Chermont Road, questioned the commissioners’ handling of the procedure and also expressed concern for emergency responders who for years had traveled the road under its original name. Blatnik’s daughter, Johnette Pollock, called for the nearly two-year debate to stop during a heated commission meeting in St. Clairsville on July 19, 2000, saying, “We did not ask for the road to be changed. We don’t want residents to have to change their mailing addresses, and we are surely not against the safety factor.”6 In June Seabright had sent a letter to the commissioners that stated that Blatnik was “at best, only a mediocre Major Leaguer.”7 In attendance at the July meeting was state Representative Charles Wilson, himself a Bridgeport native who had grown up listening to his father pass along stories of Blatnik’s athletic accomplishments. “In my eyes, he was always a hero, someone who should be looked up to,” Wilson told the crowd jammed into the commission chambers. “When I heard the commissioners were having this meeting today, I knew whatever I had to do in Columbus was not as important as being here today.”8 When the commissioners voted to keep the name as Blaine-Chermont Road and instead erect a sign under the one put up by the Ohio Department of Transportation in honor of Blatnik, a chorus of cheers bounced off the walls, the likes of which Blatnik had not heard in a half-century. Blatnik suffered another series of strokes, and his health continued to decline in the coming months. He died on January 21, 2004, at his home along the road that bears his name. He was 82 years old. He was buried in Holly Memorial Gardens in Pleasant Grove, Ohio. Johnson, Lloyd, and Miles Wolff, The Encyclopedia of Minor League Baseball, 2nd edition (Durham, North Carolina: BaseballAmerica). The Baseball Encyclopedia, 9th edition. Bedway, Nick, untitled column, Wheeling News-Register, September 6, 1998. Huff, Doug, untitled sports column, The Intelligencer, Wheeling, West Virginia, January 24, 2004. Wickline, John, “Ohio Baseball Hall of Famer Blatnik Recovering From Stroke,” Wheeling News-Register, September 8, 1998. _____, “Blatnik Selected as Man of the Year,” Wheeling News-Register, November 29, 1998. _____, “Blatnik to be Honored With Sign, Not Road,” The Intelligencer, Wheeling, West Virgnia, July 20, 2000. _____, “Bridgeport High Honoring John Blatnik During Alumni Weekend,” The Intelligencer, Wheeling, WestVirgnia, June 28, 2001. _____, “Baseball Player Turns Veteran,” Wheeling News-Register, September 9, 2001. Obituary, The Intelligencer, Wheeling, West Virginia, January 22, 2004. Several conversations between the author and Johnny and Gladys Blatnik between 1998 and 2004. Blatnik, Al, eulogy delivered at the funeral, January 24, 2004. 1 John Wickline, “Baseball Player Turns Veteran,” Wheeling News-Register, September 9, 2001. 5 John Wickline, “Ohio Baseball Hall of Famer Blatnik Recovering From Stroke,” Wheeling News-Register, September 8, 1998. 6 “Blatnik to be Honored With Sign, Not Road,” The Intelligencer, Wheeling, West Virginia, July 20, 2000.